Marc Jacobs knows fashion. But he also knows beauty like the back of his hand. This is a man whose favourite colour is ‘shine’ so it’s only natural that his make-up collection would be amazing. Luckily the entire Marc Jacobs beauty make-up collection has just recently launched at John Lewis Oxford Street so it’s available now! I have to say as well that I am seriously impressed with the products in the collection – they are (dare I say?) probably some of the best products around – in particular the Re(Marc)able foundation and the lipsticks. OMG, the lipsticks. The pigment on those babies last all day and don’t feather or smudge -totally worth £24 if you ask me. So let’s first talk base – foundation, I mean. The Re(Marc)able foundation is seriously the bomb. This stuff goes on like silk to the face, it sinks in, it blends like a dream, it actually enhances but also gives great coverage. I will most likely be replacing my bottle when it runs out – it’s that good. And I’m rather picky about foundations because sometimes they don’t blend well with my skincare. However Re(Marc)able will. And Marc himself likes the look of skin so be sure that this is a super skin enhancer and makes you look like you are glowing. Next up are the lipsticks which are seriously so so good. 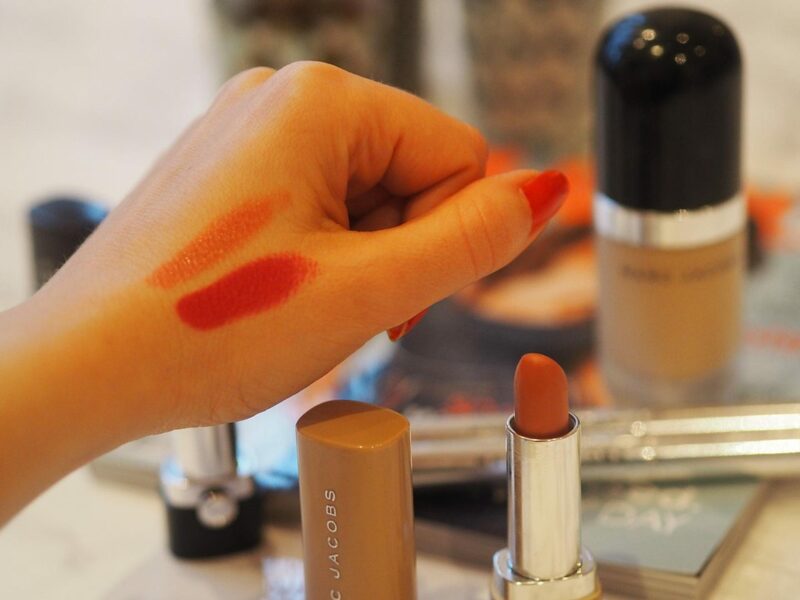 I’ve got a few of them – one of them in ‘New Nudes’ in the shades o ‘Eat Cake‘. This makes me think of Marie Antoinette -the colour is a pretty shade of pearly pink – good for everyday for a very pretty feminine look. The next shade which I love (because I’m a fan of the bold lip) is a bright red (the kind of red that will suit anyone) in the shade of ‘Oh Miley!‘. Yes, you got it. This is the iconic Miley Cyrus red lip. I really honestly think this is the best red lipstick I’ve ever owned. The pigment in it is incredible and the lipstick is not drying, nor fades. I applied this in the morning at 7:30am and it was still bold as can be by noon. I retouched the color once in the afternoon but otherwise all good! Another product I love from this collection are the Twinkle Pop Eye Sticks. These are super cooling and give a pop of color on the eyelid. They make it really easy to create a smokey eye as well. I have the shades ‘Three Shakes‘ and ‘Au Revoir‘. One is a light pearly color and the other is a cinnamon brown which is perfect to draw around the eye. I use these two every day! Navy is also in this season for eyes and with that I am absolutely loving the Marc Jacobs Fineliner Ultra-Skinny Gel Eye Crayon, Code Blue. Love the name, love the colour. A new product that Marc Jacobs beauty has just launched is the Air Blush (I have the colour 504 Kinks and Kisses). This is a beautiful blusher/bronzer that adds a lovely fresh colour to the face. The technique to apply it is called draping which involves actually adding colour onto the cheeks and then sliding the brush down the face lightly. The Air Blush basically makes me look alive so it’s well worth a look at! I am also a brush magpie so have the Marc Jacobs ‘The Face III’ Brush which is an all around brush that can be used to pretty much apply anything and everything. It has a fat, easy-to-grip handle that is ideal for buffing. And as Marc’s favorite color is ‘shine’ there are also the High Shine Lip Lacquers to talk about (I have colour ‘French Tickler‘). I love a high shine lacquer because they make my lips look fuller and I’ve really fallen for glosses again these days. Again, you are going to get a super high shine with these and they certainly do what they say on the tin. Last but not least are the High Shine Nail Lacquers – I have ‘Resurrection‘. The packaging is seriously so pretty – everything in this collection is so covetable. I can almost guarantee you will be happy with your purchases! Don’t forget to follow me on Instagram/Twitter/SC @beautyrocksblog for all my latest updates and adventures!